We love seeing other builds equipped with PIAA lights but when the opportunity came to get our hands on a 2015 Jeep Rubicon of our own, we didn’t waste any time. From the start we wanted to make sure this Jeep was built for the trail and not an over the top show rig bursting at the seams with flashy upgrades. As comes natural to us, we first turned our attention to adding some light output. All that light won’t do any good if we can’t make it down the trail so soon after we added some clearance and durability. 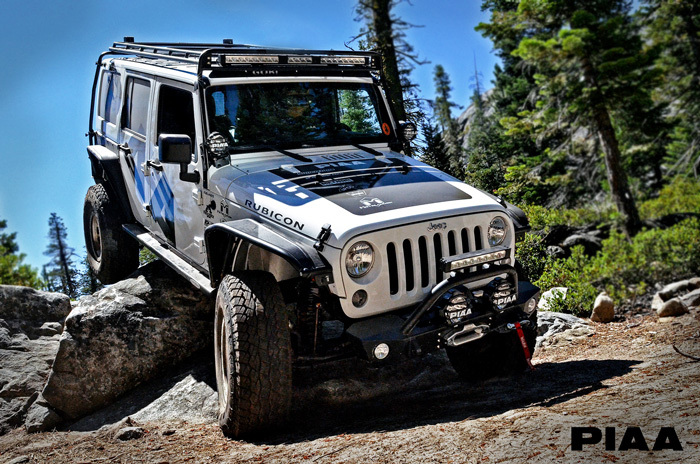 We’ve had the opportunity to put the Rubicon through its paces at the Jeepers and Jeep Jamboree in Northern California and in Oregon with outstanding results thus far. Everything feels rock solid and has been able to handle most crawls without a problem. We look forward to getting out to upcoming events and hope to see you on the trail!